As a geology enthusiast and professional photographer, Abigail Weibel was naturally drawn to Arizona’s landscapes. But it was learning about ASU’s School of Earth and Space Exploration, and the interdisciplinary fields that the school had to offer, that solidified her decision to attend ASU. “The School of Earth and Space Exploration is a special environment where teamwork and collaboration across fields are encouraged, expected and incredibly fun. Astrophysicists, geologists, engineers… everyone works together,” says Weibel. 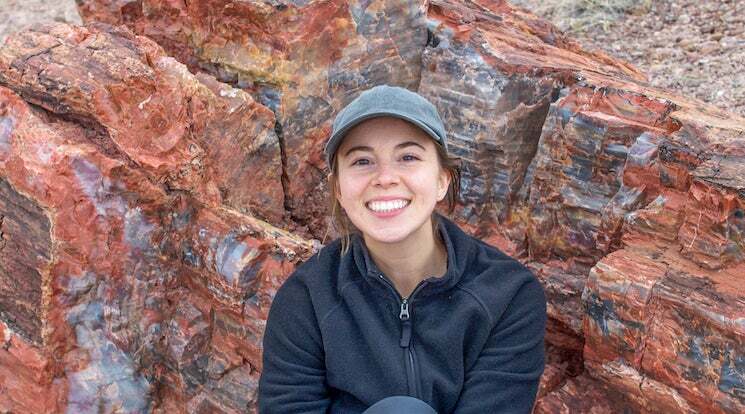 Weibel, a senior at ASU majoring in geological sciences, didn’t commit herself full-time to education until she knew exactly what she wanted to study. While her friends were graduating from college, she was gaining real-world experience working office jobs and doing freelance photography work. Inevitably though, after reading a course catalogue and discovering what a degree in geology would entail, she was immediately hooked on the idea. Weibel then made the decision to move to Arizona and give college her full attention. “I’m glad I took my own path because my motivation and passion would not be the same if I hadn’t,” says Weibel. Outside of the classroom, Weibel has also participated in a variety of extracurricular and research opportunities offered by ASU. Recently, she was accepted to participate in the “Psyche Inspired” program, a student collaboration project that is part of the ASU-led NASA Psyche Mission. This program brings together undergraduate students from different disciplines and majors to share the excitement and innovation of the NASA Psyche Mission in new ways, through artistic and creative works. “It has given me the opportunity to see how influential art can be and how seamlessly it meshes with science,” says Weibel. Weibel has also been able to work in labs and in the field with ASU faculty members Dan Shim, Heather Throop, Cassie Bowman, and François-Xavier Joly. “The professors here have encouraged my curiosity and taught me to follow that up with critical thinking and teamwork,” says Weibel. Learn how to write a professional e-mail. Don’t compare yourself to other students. Weibel will graduate in May this year, and while her plans are still in the works, she is considering graduate school for geological sciences. She’d like to continue both her field work and photography, not surprisingly combining her skills as an artist and scientist in true interdisciplinary style.